This promotion will be eligible to new residential conferences booked from 1st – 31st August 2017. The conference must be held between 1st July – 30th September 2017. Conferences booked prior to 30th July will not be eligible. 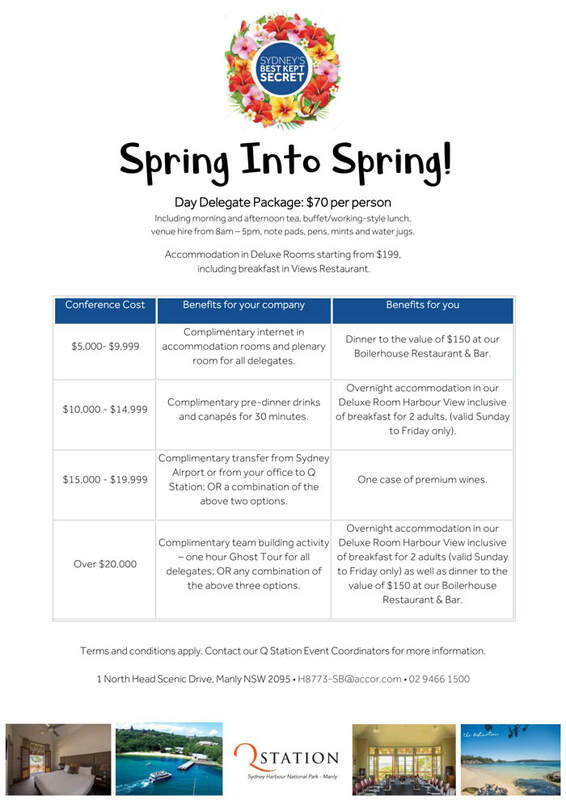 The offer is valid for both residential and day conferences only (excluding audio visual and external activities). The direct giveaways (benefits for conference organiser) will be given to the organiser once the final invoice is settled to the hotel. This offer is open to all corporate meeting planners. Pre-dinner drinks are based on standard beverages of house beer, house wine, soft drinks and juices. The bus transfers from Sydney Airport OR your office to Q Station and return is up to $600 in value. Any further expenses will be charged to your company’s account.